Pottery Trial Classes are great fun and take place in our on-site pottery studio. They are usually bookable Thurs-Sun 10-12 or 2-4 (less availability some weeks depending on our schedule). Food & drink can be pre-ordered and added to your pottery experience (for groups of 4 or more)! 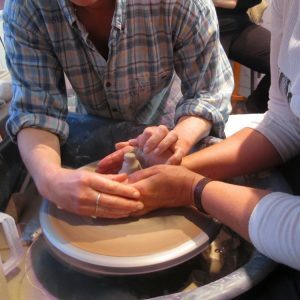 They are great fun and are designed for those who have not had any experience with clay and provide a chance to try it out in a relaxed atmosphere with lots of help and encouragement. They are perfect for young and old (suitable for children 5 years old and above), families or groups and are a great way to celebrate a birthday or hen do. 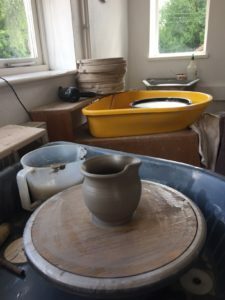 We take 2-8 people in our studio and the classes are 2 hours long allowing a chance to try three pottery techniques (wheel throwing, pinch pots and working with slabs of clay). At the end of the classes you can choose to leave up to 4 of your favourite pieces with us for firing and glazing with your choice of our house glazes. Pottery trial classes cost £30.00 per person including materials and glazing and firing and we fire every 5-6 weeks. The price of the class includes the option to leave up to 4 pottery pieces per person for glazing & firing. Extra pieces will be charged at £3.00 per piece. Collection of pottery is possible in person if you live locally or if a firing is due while you are here. If delivery is required it is a one off cost of £16.50 to get a box of pots sent to one UK address. If some of your party are painting pottery as well, then the delivery cost can be combined across both activities. From our perspective well-behaved dogs are welcome in the studio (but remember there will be other people’s pottery stored on the shelves!) and as the studio isn’t huge then other people in the class must also be happy to have dogs in the studio with them. Contact us to find out more or to make a booking. In terms of payment, we prefer CASH if possible as we are no longer allowed to share the cost of providing card payment facilities with customers. We hope you understand. NB: There will be no pottery trial classes or pottery painting sessions on 15th June, or between 20th – 29th June & times/availability may vary on special event days/weekends.